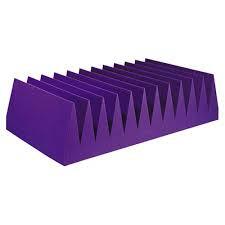 More on the Auralex Acoustics Venus Bass Traps (Purple) 12VEN24PUR below. Auralex's new Venus bass trap achieves a prodigious level of low-frequency sound control at room boundaries (where most low-frequency problems begin) and provides broad bandwidth absorption for large or small spaces. Venus Bass Traps ship in 2 ft. x 4 ft. x 12 in. panels but are often cut in half and combined with 12 inch Auralex CornerFills. 2 Venus bass traps, measuring 2 x 4 feet each. Venus traps are often cut down to a 2 x 2 square and then paired with 12 inch CornerFill. Suggested Adhesive: 1 Foamtak cannister or 2 Tubetak tubes per box (sold separately).